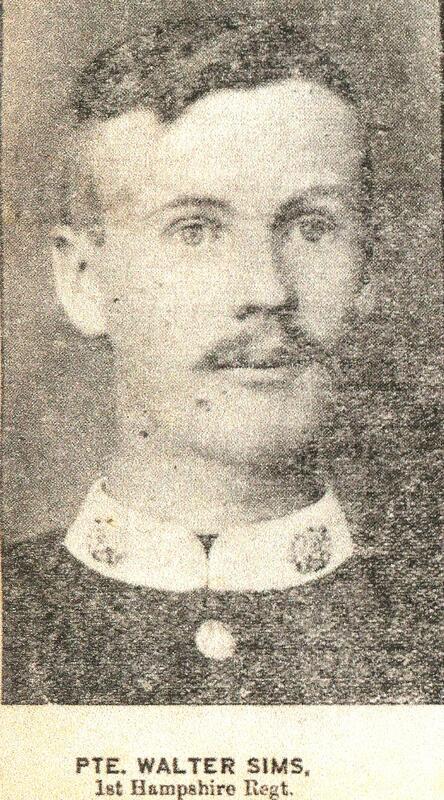 As a reservist, Walter Sims had been among the first to be recalled to the colours. That sounds rather noble, but in fact he and the four others from the village had piled into Eli Goodyear‘s waggon pretty unceremoniously, without time to say much of a proper goodbye, as he had volunteered to drive them to Andover railway station. But of course their friends had waved and cheered, and made a great fuss of them. As it happens, he had managed to say goodbye to his father, also Walter but called ‘Wallie’ for short. He had been ill with bronchitis for months, and at the good age of 86, had gone to meet his Maker last Sunday. After yesterday’s news of war, Walter had been able to bring forward his burial to early this morning so as to be sure of being able to attend and pay his final respects. And, scarcely having had time to gather his thoughts, this afternoon he was sitting in a waggon with four other chums from the village, on their way to the battalion depot in Winchester to be licked into shape for a couple of weeks: then they would be off to the front. Only yesterday, he had been expecting to spend this week out in the fields, helping with the last of the harvest. And he had been looking forward to supper at The Plough Inn afterwards, paid for by the farmer! Walter was of course sad at his father’s death, but in truth he had seen little of him in recent years. When he had gone off to the Boer War 1 in his twenties, his parents had remained together with his younger brother Sidney. 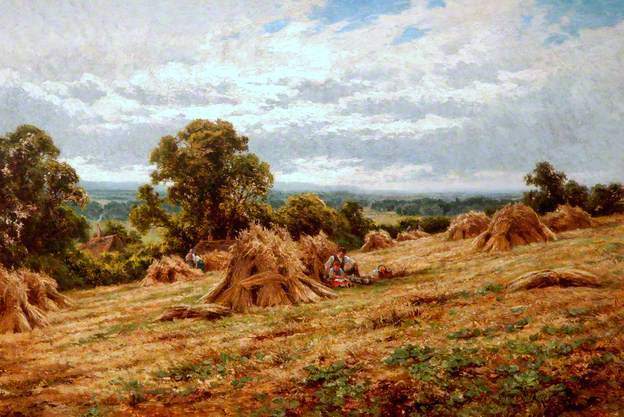 But by the time he returned, his father had moved out to live with Sidney at a farm in Andover Down, about six miles away, and his mother had decided to stay in the centre of St Mary Bourne. Walter had not yet married, and had naturally stayed with his mother, and now it was her that he was worried about. He could help her a bit financially now that he was back in the army, but he would never forget the look on her face as she hugged him farewell, and he knew she had been wondering if she would ever see him again. Perhaps she would take his father’s place in Sidney’s home in Andover Down, though he now had a wife, and he was not sure how wife and mother might get on under the same roof. But all her friends were in the village. Maybe she might persuade Sidney to come back to St Mary Bourne. But he had begun to carve out a future for himself there, and would not want to return. And so it went on, turbulent thought succeeding anxious worry. It was worse that there was nothing that he could do, not for the foreseeable future. 1 No documentary evidence has yet been found of Walter’s service in the Boer War (partly, at least, because Walter Sims was a common name at the time). However, he is said by the Andover Advertiser to have served six years in South Africa, there is no trace of him in the 1901 UK census, and he would not have been called up at this early stage if he had not already seen military service. 2 We know from the war diaries of the 1st Battalion of the Hampshire Regiment that they did not embark from Southampton for Le Havre until 22 August, two weeks three days later. Presumably the intervening time was necessary to assemble the reservists, re-train and re-equip them – it would have more than a decade since most of them had seen active service. When war was declared the 1st Battalion of the Hampshire Regiment was part of the 11th Brigade, in the British Army’s 4th Division. They were originally based in the garrison town of Colchester, but moved to Harrow. It was earmarked to embark for Europe as part of the British Expeditionary Force as soon as war broke out. Later in the war at Ypres and the Somme the Territorial and Kitchener Battalions bore the brunt of the fighting, but in 1914 the BEF comprised regular, pre-war Soldiers. The 1st Battalion of the Hampshire Regiment left Harrow at 12.20am on 22 August 1914, bound for Southampton. 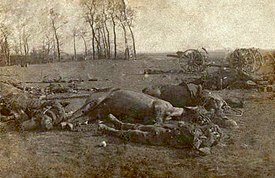 At 7am half of the Battalion and the Headquarters embarked on the Breamaer Castle, and the other half on the Castrian. At this point, most of the men were no doubt hoping that the war would be over by Christmas. Julius Caesar, Act II Scene ii. In the Brazilian rainforest, a butterfly stretched its wings and flew to its next perch. In a remote part of north-west Hampshire, the sun had barely set on one of the shortest nights of the year. The church clock had chimed the hours through the night as usual, but Bourne Farm‘s resident rooster ensured that no one at the north end of the village either was able to sleep in that morning, even though it was a Sunday. Eli Goodyear, fifty-seven years old, recalled with some satisfaction that his two sons and daughter now had the duty of feeding the animals and it was no longer his responsibility to get up at dawn to milk the cows. The first task of his day would be to lead the family on their weekly walk to the service of Mattins at St Peter’s, led by the Revd William Tovani. Eli was the sixth generation of his family to work in farming in St Mary Bourne: he could trace back his lineage to William Goodyear who had been born in the village in 1690. And he hoped that his eldest son, George, would continue after him in his turn. It had been a busy week, with the first cut of hay to feed the animals over the winter. All nine of his surviving children had been called in to help, in addition to his usual farm hands, but there was still much to do. He would ask the vicar to pray for continuing fine weather next week to help him and his fellow farmers. But before that he needed to write to his older brother William who had moved into Andover some years earlier – he would just have time to catch the 10.45 Sunday postal collection. Austria-Hungary was to blame the Serbian government for the attack in the hope of using the incident as justification for settling the question of Slav nationalism once and for all. As Russia supported Serbia, Franz Josef would delay declaring war on Serbia until Austria-Hungary received assurances from Kaiser Wilhelm that Germany would support their cause should the Russians intervene, with the probable involvement of Russia’s ally, France, and possibly Britain as well. On July 28, Austria-Hungary would declare war on Serbia, precipitating the collapse of the tenuous peace amongst the great European powers. Within a week, Russia, Belgium, France, Great Britain and Serbia were to line up against Austria-Hungary and Germany, and the war to end all wars, the first truly global war, would begin. If this post feels like a series of unconnected events, that is probably how it felt to those living at the time as well. One of the effects of this global series of earth tremors is that it became increasingly difficult to live in a solipsistic bubble of one’s own immediate surroundings. 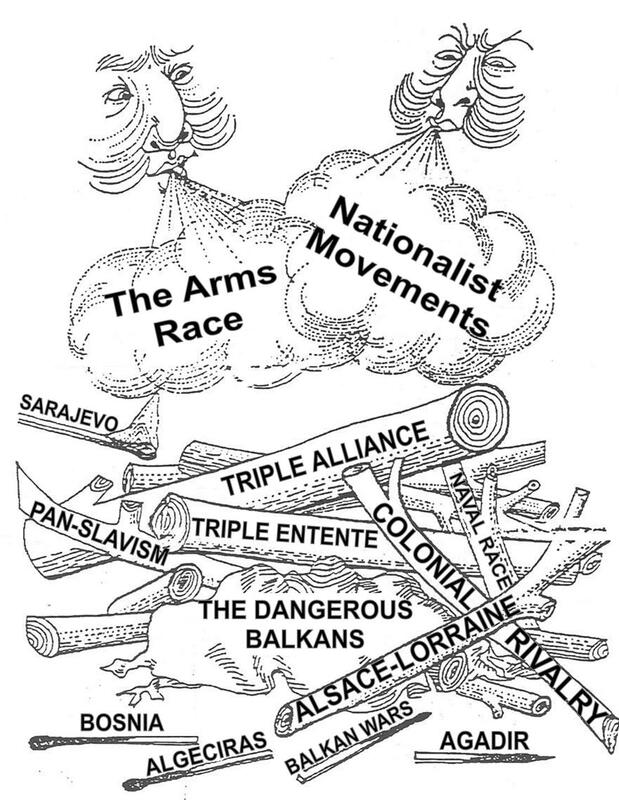 Although, with the benefit of hindsight, would-be international mediators and theorists have a tendency to feel that the war could have been averted, this is not the practical conclusion reached by those who have ever played the game ‘Diplomacy’ in which, no matter who the participants are or how they play, war usually ensues. Beginning with the assassination of Archduke Franz Ferdinand, Dr Annika Mombauer explores the opposing debates about the origins of World War One. Is it possible for historians to arrive at a consensus? How could the death of one man, Archduke Franz Ferdinand, who was assassinated on 28 June 1914, lead to the deaths of millions in a war of unprecedented scale and ferocity? This is the question at the heart of the debate on the origins of the First World War. How did Europe get from the assassination of Franz Ferdinand and his wife to the situation at the beginning of August when Germany and Austria-Hungary were at war with Serbia, Russia, France, Belgium, and Britain? Finding the answer to this question has exercised historians for 100 years, and arriving at a convincing consensus has proved impossible. 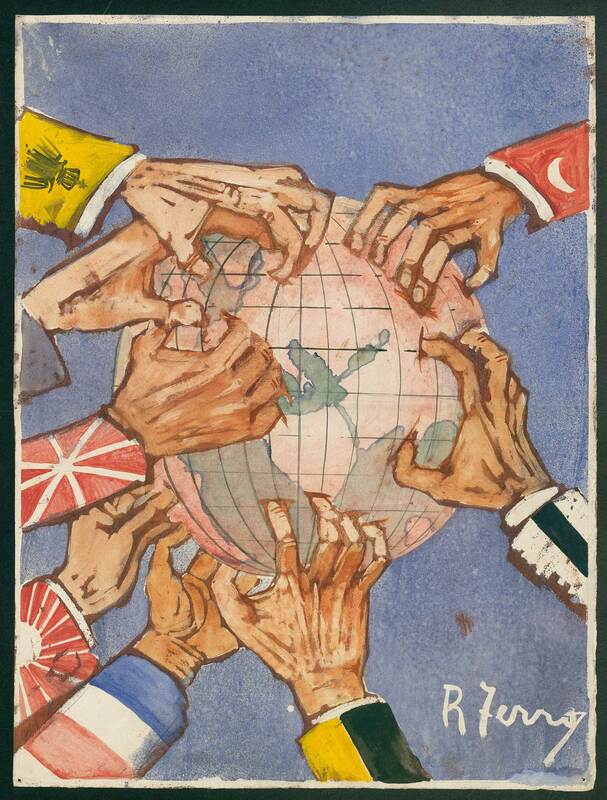 ‘Cupidity’, a satirical drawing showing the hands of men from countries involved in World War One, arguing for control of the world. The 1911 census and Kelly’s Post Office Directory provide the inhabitants of Bourne Farm (Eli Goodyear was still there in the 1920 directory), as well as details of the Goodyear family. You can see Bourne Farm marked on the 1875 Ordnance Survey map. The St Mary Bourne history group maintain a Bourne Valley ‘family’ tree on ancestry.co.uk, which chronicles the relationships in these villages, including Eli’s ancestors. The mundane details of Eli’s reconstructed morning are of course fictional, but based on reality, that is these Goodyears were ‘church’, not ‘chapel’, the three eldest children give their occupation as working on the farm in the 1911 census, Eli’s elder brother had indeed moved into central Andover and there was a 10.45 postal collection on a Sunday.